Evelyn “Evie” Klens, 87, of Torrington, CT, peacefully passed away Thursday Aug. 23, 2018, at the John Bertram House Assisted Living, surrounded by her loving family. She was the wife of the late Edward Klens. Evelyn was born June 1, 1931, in White Plains, NY. Daughter of the late John and Rose (Bertolucci) Marchetti. She was employed as the office manager for Dr. Mark Finn and was also the owner of Globe Cleaners. She was a member of the Beta Sigma Phi, Torrington Woman’s Club, and the Connecticut State Dental Society. Evie’s passion was spending time with her family and her many treasured friends. Her flair for entertaining will always be remembered by all who knew her. She was an avid UCONN girls’ basketball fan and had a love for the ocean after re-locating to be close to her family. 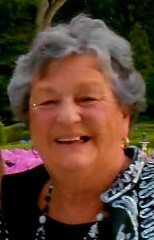 She is survived by a son, John Klens and his wife Lori of Springborough, OH; a daughter, Nancy Klens Magarian and her husband Kevin of Swampscott, MA; five grandchildren, Alexa, Cara, Kathryn, Jack, Gretchen; sisters-in-law Anna Galgano and Eleanor D’Amato, as well as several nieces and nephews. She was preceded in death by two brothers, Dante and Nello Marchetti. Funeral services will be held on Saturday, September 15, 2018, with the cortege leaving at 10:00 a.m. from Cook Funeral Home, 82 Litchfield St., Torrington to St. Peter Church, 107 East Main St., Torrington for a Mass of Christian Burial at 10:30 a.m. Burial will follow at St. Francis New Cemetery. Calling hours will be held on Friday, September 14, 2018, from 5:00 p.m. to 8:00 p.m. at Cook Funeral Home.